HEL started life in 1985 as 'Hose Equip', a company based in the Industrial; Marine and Hydraulic sector of the marketplace. It was acquired by its current owners in 2000 and moved into the performance fluid transfer marketplace. At that point, the company's name changed into Hose Equip Limited, the now famous Devil's tail logo was designed, and the HEL Performance brand had arrived! Since then, HEL has gone from strength to strength. Based in Devon, HEL now manufactures hose kits for hundreds of different motorcycles. HEL hoses are a great quality product, manufactured to a very high standard, using stainless steel braided fluoropolymer and stainless steel swaged fittings to avoid any problems of corrosion. All HEL fittings are made from stainless steel, and are available in many colours. A coloured PVC coating is available if you need more colour in your life (applied during manufacture, not heat-shrunk on afterwards). Coloured stainless steel fittings are also available. The swaged fittings are lighter and slimmer than reusable fittings and are made of top quality stainless steel. HEL Performance is very proud of the fact that all the brake line components are made in Britain, including the stainless steel braided brake hose and all the stainless steel brake line fittings. From small beginnings, HEL performance products have gone global and are now available all over the world in over sixty-eight countries and, having passed stringent safety standards by regulators across the globe, are street legal anywhere in the world. 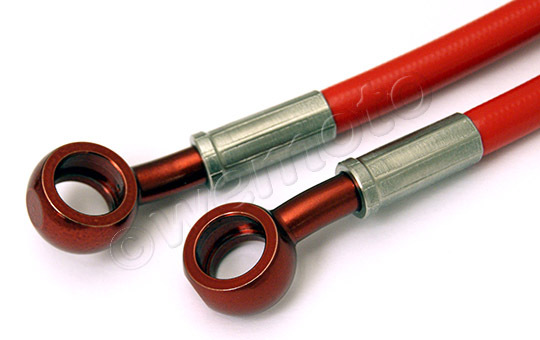 One other salient point: HEL brake line kits come with a lifetime warranty. What's not to like!